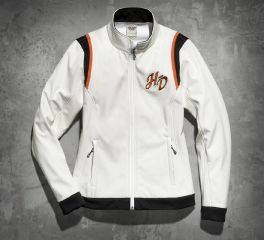 Harley-Davidson® Women's Miss Enthusiast Soft Shell Jacket is made of 91% polyester, 9% spandex soft shell with brushed polyester backing. 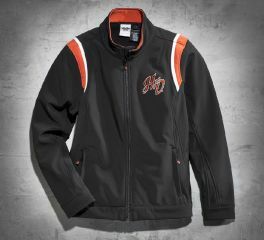 It features a full front zipper, zippered hand warmer pockets, integrated toggle hood pull, extended rib-knit cuffs with thumbholes, and embroidered graphics. 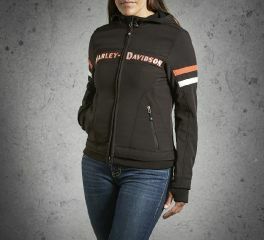 A lot of ladies play favorites with our soft shell jackets because of their versatile styling. This season's Miss Enthusiast Soft Shell Jacket is another winner. Casual when it's worn unzipped over a tank or cami and cozy with its hood and extended cuffs. Lightweight and breathable, the Embroidered Soft Shell Jacket also features just the right amount of stretch for a perfect fit. 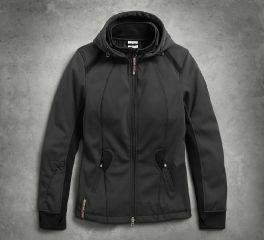 Water-resistant and windproof, our softshell casual jacket will take whatever mother nature throws at you.